Well this little piece of history really DID creep me out. It’s like finding out the Tooth Fairy was an insane dentist who pulled little children’s teeth while they slept or St. Nick AKA Santa Clause was a house thief. I will never look at my grandmother’s pink flamingos and fat little gnomes in her garden the same way. Lol! OK! Let’s start with the bizarre fact that those chubby little guys have not always been cast in plaster and motionless. Garden gnomes used to be real people the rich hired as decorations! Yuck! While garden gnomes might now only be considered as kitsch plaster ornaments, their roots trace back to the 18th century. Apparently, the wealthy English elite during this period of time took a lot of pride in displaying their fortunes. 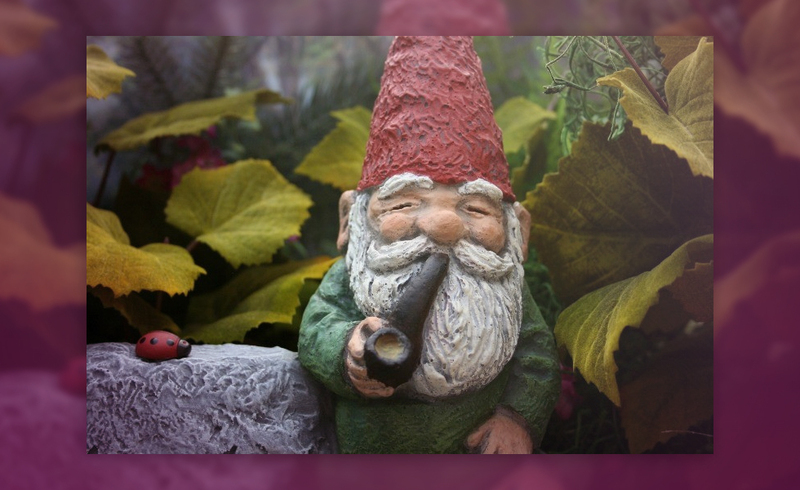 One of the most popular ways of doing that was the tradition of displaying gnomes on their lawns which were actually played by a real, living, breathing man! Yes, you read that correctly. These people were called “ornamental hermits,” and if you were a wealthy landowner and member of the nobility, chances are you had one living on your property. In order to understand this bizarre tradition, there were two huge trends that exploded during the 18th century: a passion for solitude and a garish display of wealth. Building a small hut for a sad-looking hermit who you let live free of charge gave you, as a wealthy landowner, a chance to showcase both these passions. Landowners looking for a hermit might post an ad like this: “He shall be provided with a Bible, optical glasses, a mat for his feet, a hassock for his pillow, an hourglass for timepiece, water for his beverage and food from the house. He must wear a camlet robe and never, under any circumstances, must he cut his hair, beard, or nails, stray beyond the limits of so and so’s grounds or exchange one word with the servant.” While a person eccentric enough to desire a life of total solitude like this might be considered bizarre today, these were traits that were lauded in the 18th century. The hermit’s main job was to make sure they did not, under any circumstances, interact with guests. Visitors would often stop by the hermitage to view it and its occupant, but never for chit-chat. That was forbidden. Eventually, thanks to technology and the realization that keeping a person hostage on your front lawn was a rather grim thing to do, the trend died out. One day, possibly a few hundred years in the future, someone will probably make the same remark at how gross it was that a person would sit and play a Xbox video game all day. Were these people insane when there were so many other things you could do outside and with each other than pressing buttons and looking at a square screen? Just saying! Creating a new relationship based on love and caring. Obviously since the card was pulled inverted, it shows this was not a loving relationship between the living hermit gnome back then and the rich landowner. Working hard and struggling to complete a project or situation. Inverted, I feel it represents the basic energy of the hermit gnome back then…..doing nothing. A male energy carrying out contracts, giving advice and can also represent a cruel person. I would say this would be the landowner’s energy who hired the hermit gnome to show just how rich and cool he was and who also didn’t give a damn about the person he hired.